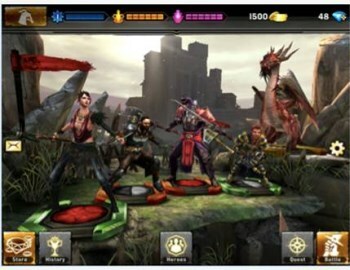 Heroes of Dragon Age will reportedly be a combat-focused, free-to-play mobile game based on BioWare's hit RPG. I qualify this Heroes of Dragon Age business with "reportedly" because it's all "word on the street" kind of thing, but it sounds fairly certain at this point that Electronic Arts is getting ready to roll out a cross-platform mobile game - iOS and Android, in other words - in which players will assemble parties with both free and purchased characters and then set them off to do battle. It is, if you believe the rumor, being developed by EA Capital Games, the social games studio formerly known as KlickNation, which EA acquired in 2011 and renamed to BioWare Sacramento, and then re-renamed to EA Capital Games earlier this year. That's really all we have to go on right now, but there are at least a couple pieces of evidence that back the story up. Thing One, EA recently registered the heroesofdragonage.com domain, which currently boasts a big, red "Coming Soon!" blurb; and Thing Two, a Heroes of Dragon Age forum actually exists on the KlickNation forums. Eurogamer also has what it claims are the two screens taken from the game. EA hasn't said anything official about it yet but given the proximity of Gamescom, I would expect to hear something soon.